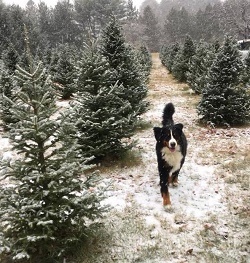 Northern New Hampshire Christmas Tree Farms: choose-and-cut Christmas trees, Tree lots with pre-cut trees, stands, sleigh rides, hay rides and related winter events and fun! 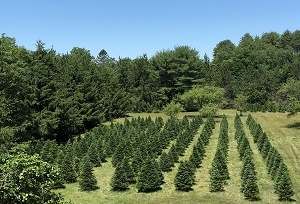 Whether you want to cut your own tree, pick a live tree and have it cut for you, buy a tree already cut or buy a living tree you can plant, this page provides detailed listings of Northern New Hampshire's choose-and-cut Christmas tree farms, places to buy pre-cut (also called pre-harvested and fresh-cut) trees, stands, sleigh rides, hay rides and related winter events and fun. Some listings are for tree farms, others are tree lots, and some only offer hay rides, sleigh rides or other winter events. READ EACH LISTING to know what each facility offers. The farms are listed further down this page, so scroll down the page! Since this service is free and open to ALL Christmas tree farms, not just those who belong to an association or pay for an ad, like almost all other websites do, this is the most complete and current listing available! I'm always looking for more to add, and to correct any inaccuracies or errors, so if you encounter any, please email me ! And please tell the farmer you visit in Northern New Hampshire that you found their farm here! I need the farmers to realize that you found them here so that they will keep their information up to date! 421 Mountain Road (Rt 171) Melvin Village, NH 03850. Phone: (603) 544-7364. Email: bpfarm@worldpath.net . A delicious 3-course buffet dinner with gratuities included. The kids will enjoy the indoor pool, there is also a hot tub and fitness center for you to enjoy as well as our beautiful AVEDA Spa. Call (603) 383-4313 today to arrange your package. On select weekends throughout the Christmas season, Santa's Village is open to give kids an extra dose of Christmas magic. In its 62nd season, Santa's Village features special shows, rides, and an opportunity to meet both Santa and Mrs. Claus. Don't miss out on this one of a kind theme park experience during your holiday trip to Jackson, New Hampshire. Conway Scenic Railroad, 38 Norcross Circle, North Conway, NH 03860. Phone: (603) 356-5251. Alternate phone: (800) 232-5251. Email: info@ConwayScenic.com. Open: see their website for dates. Departing from our 1874 station in the center of North Conway Village, our train travels over historic tracks to the "North Pole" with hot chocolate served along the way. Upon arrival, families are greeted by the sight of Santa's brightly-lit headquarters atop a small hill and led there by lively elves who guide them along an illuminated path. Here, the audience is entertained with Christmas songs and an appearance by Santa himself. On the return train trip, the train's narrator leads a sing-along. This remains a truly magical experience, and we hope that you will join us this Holiday season. Tickets are only available through the Believe in Books Literacy Foundation, a local non-profit for which this event is its major fundraiser. tickets are still available through packages that are sold through some of our Places to Stay partners . 185 Chase Hill, Albany, NH 03818. Phone: 603-447-2181. Reservations: 1-800-426-4147. Fax: 603-447-5726. Email: marc@darbyfield.com. Now Offering Daylight Carriage Rides from June 1 to October 31(Please call for days and times of operation). Step back in time at the Darby Field Inn, with a romantic horse drawn sleigh ride. Experience New England's mid-winter beauty at it's best as your private sleigh for two, pulled by beautiful Welsh Cob or Belgian horses wisps you away through the woods and to a snowy meadow overlooking the Mount Washington Valley. Rides depart and return at our doorstep and are open to houseguests and public alike! Nighttime rides feature winding paths, romantic moonbeams and stunning star studded sky. Lamps fitted to the sleigh add to the ambiance. Daytime rides feature a spectacular view of Mount Washington. After your half hour ride, complete the evening with a four-course candlelight dinner. For more information, see these pages: Availability & Reservations , Brochure Request , Testimonials . 2555 West Side Road, North Conway, NH 03860. Phone: 888-414-8353 Toll Free U.S., 603-356-2694 or Stables Only: 603-356-6640. Click here for rates and hours . 15 Greene's Basin Road, Moultonborough, NH 03254. Phone: (603) 253 9937. Alternate Phone: (603) 387 2196. Email: joaltreefarm@prodigy.net. Open: Thursday to Sunday, from 9 am to 4 pm, Friday after Thanksgiving to December 24 or other times by appointment. Directions: Click here for a map and directions. Payment: Cash, Check. You Choose and We cut varieties: Balsam Fir, Blue Spruce, Colorado Blue Spruce, White Fir (Concolor Fir), Eastern White Pine, Fraser Fir, Grand Fir, Turkish Fir, and other varieties (call!). Route 16, Jackson, NH 03846. Email: reservations@luxurymountaingetaways.com. Directions: Click here for a map and directions . Your journey through our Victorian estate begins the moment you board our custom made Austrian Sleigh, fully upholstered for your comfort, pulled by magnificent draft horses. Travel along a timeless path by the scenic Ellis river and through the woods. Sleighs stop so that you may visit with the European fallow dear in Emerald Forest. 121 Maple Street, Union , NH 03887. Phone: (603) 568-7008. Email: bryan.sanford@hotmail.com. Open: 10 am to 4 pm pm on: November 24 to 25 December 1 to 2 December 8 to 9 December 15 to 16. Directions: Just off of route 16 follow signs to farm. Click here for a map and directions. We use natural practices, but are not yet certified Organic. Payment: Cash, only. We are a small tree farm in Union, NH. We have 300+ trees to choose from this year. Come cut your own tree! For 2018 all trees are $50 We have Balsam/Fraser Fir trees from 4 feet to 11 feet tall. No tagging, just come choose a tree, cut it down, and take it home. Follow signs to park right on the tree lot. U-Choose and Cut varieties: Balsam Fir, Fraser Fir. Route 302, Bretton Woods, NH 03575. Open: December 21-29, 2013. Open: Reservations are required for Bretton Woods Stables carriage, sleigh and trail rides. Carriage rides are offered year-round at Mount Washington Resort as weather permits. Sleigh rides are offered during the winter as conditions permit from mid-December - mid-April. For the latest information or to make your reservations, please contact our Activities Concierge Desk at (603) 278-8989. .Directions: Click here for a map . Phone: 603-278-8989. Also, Skiing, Snow tubing and ice skating are available. Children and adults of all ages will find merriment at Omni Mount Washington Resort's winter wonderland. Magical in its snowy splendor, Mount Washington Resort welcomes winter with a warming embrace. Enjoy a festive celebration of sleigh rides, snowshoeing, skiing, stories with Santa, and holiday refreshments. Snuggle in front of the fire with eggnog or cider before being tucked in by one of Santa's elves. When the sun sets, participate in the entertaining evening family games or relax in front of the fireplace as you prepare yourself to do it all over again tomorrow. Christmas Day invites a full day of skiing and outdoor adventure! 162 Joalco Road, Strafford, NH 03884. Phone: (603) 664-2934. Email: highmeadow@juno.com. Open: UPDATE for 2018, Their website is gone; Does anyone have current information, are they still in business and open? If so, please write me, their last reported hours were 9-4 on weekends and 1-4 during the week, other times by appointment; We open for tagging on weekends Columbus weekend and for cutting at 1 pm the Friday after Thanksgiving. Directions: Wrath From the East, West, or South take route 4 to Bow Lake Road in Northwood. Follow Bow Lake Road around the West side of Bow Lake, about 3.5 miles to Joalco Road. High Meadow is 0.7 miles up Joalco Road. From the North take route 202A to Bow Lake Village and follow the Province road 3.1 miles to Joalco Road. 528 Presidential Highway, Jefferson, NH 03583. Phone: (603) 586-4445. Open: See their calendar page. They have rides, movies, puppet shows, entertainment, food, and much more. Christmastime is "the most wonderful time of the year" especially at Santa's Village. Santa greets every child, and listens ever so attentively to all the wishes and wants of the season. Mrs. Claus joins in on the hospitality and offers some warm wassail for all their guests. If you visit, be sure to stay 'til after dark when the beautiful lighting throughout the park displays a sense of well-being and warmth on those cooler nights. Dress warmly as it gets snuggly cold on the Skyway Sleigh Monorail or the Merry Christmas Ferris Wheel. Yes, 14 rides are operating and the festivities are all geared to Christmas. Below is a list of rides that will be open (weather permitting): Skyway Sleigh Monorail, Antique Cars, Santa's Express Train, Pixie Mix, Christmas Carousel, Loopin' Louie's Flying School, The Great Humbug Adventure, Santa's Smackers (Bumper Cars), Merry Christmas Ferris Wheel, The L'il Drummer Boy, Himalaya, SS Peppermint Twist, Rockin' Around the Christmas Tree, Santa's Chimney Drop, The Fire Brigade, Rudy's Rapid Transit Coaster (open only if the temperature is 32 or above). As we celebrate our 60th season, we are very proud of our newer 3-D show entitled "A Tinkerdoodle Christmas." It will leave you laughing at the antics of L. Fastidious Tinkerdoodle as he prepares Santa for his yearly journey on Christmas Eve. 108 Marshall Hill Road, Colebrook, NH 03576. Phone: 603-237-5702. Fax: 603-237-8439. Email: sibgotree@gmail.com. Open: 7 days a week 8 am to 8 pm. Directions: Click here for a map and directions. Payment: Cash, Check, Debit cards, Visa/MasterCard. Click here for our Facebook page. 679 East Colebrook Road, Colebrook, NH 03576. Phone: 603-237-5273. Email: xmas@weirtreefarms.com. Open: November and December seven days a week from 8am to 5pm Weir Tree Farms has been a family owned and operated Christmas tree farm since 1945. Our farm is a wholesale, mail order, and choose and cut operation offering Fraser, Balsam, Fralsam� and Korean x Balsam Firs. The Fralsam� Fir is a hybrid cross between the Fraser and Balsam and was developed on our tree farm. The Korean x Balsam Fir is a hybrid cross between the Balsam and Korean that we are currently working with on our farm and it is showing great promise. 470 Route 25, Rumney, NH 03266. Phone: 603-294-6292. Email: backwoodsfarm1@gmail.com. Open: Monday to Friday from 9 am to 8 pm Saturday and Sunday from 8 am to 9 pm November 19 to December 24. Directions: Exit 26 off 93 follow Route 25 for 5 miles, at Traffic circle take first exit to continue on Route 25,follow 1.7 miles we are located on the right. Click here for a map and directions. Petting Farm: April 1 to December 24. Payment: Cash, Check, We accept all major Credit cards. 31 Derush Road Canaan, NH 03741. Phone: (603) 523-7023. Email: royw51.weaver@gmail.com. Balsam Fir, Frasier Fir, Concolor Fir, White Pine, Red Pine, Scotch Pine, Colorado Blue Spruce, and a limited selection of exotic evergreens. We also offer small potted evergreens. Note: their website frequently does not work because it requires Flash which is blocked by many browsers for the security risks it creates. 371 Cherry Valley Road, Bethlehem, NH 03574. Phone: (603) 444-6275. Email: finnegansfinefir@aol.com. Open: 9 am to 5 pm, 7 Days a Week, from the Day after Thanksgiving until Christmas Eve. A visit to our farm is a great way to spend the afternoon. Children and adults alike can enjoy the animals, sip hot apple cider, and search through the plantation for the perfect tree. Bring the family to experience the tradition of choosing and cutting your own tree and create memories that will last a lifetime. Easton Road, Franconia, NH 03580. Phone: 603-823-5542. Email: info@franconiainn.com. Toll Free 1-800-473-5299. To make a reservation request, please go to our reservations page. Directions: For directions on how to get to the Inn, please view our map and directions page. As fall turns to winter our antique sleigh gets prepared for another season of nostalgic rides reminiscent of a bygone era. Our Belgian draft horse dons festive gear and pulls delighted guests across fields of snow in a picture-postcard setting. Offered throughout the winter season. Make your reservation at the Franconia Inn desk. Complete your experience with a hot toddy in our Rathskellar Lounge. Take the entire family or that special someone for this rare and memorable outing. Glove Hollow Christmas Tree Farm - Christmas trees-you choose and you cut, Precut Christmas trees, Horse-drawn Hayrides, Farm Animals, and free hot cocoa! 395 Daniel Webster Highway, Plymouth, NH 03264. Phone: (603) 520-9096. Email: MikeAhern172@gmail.com. Open: every day starting the day after Thanksgiving, on Monday to Thursday: 10:30am - 5 pm, Friday to Sunday: 8 am - 7 pm. Offers: Cut Your Own, Pre-cut, Wreaths, Boughs, and Wholesale Trees Horse-drawn Hayrides, Treehouse, 60 ft Tube Slide, Viewing Tower, Farm Animals, and free hot cocoa! Over 75,000 trees on 435 acres. Glove Hollow Christmas Tree Farm a cut your own, pre-cut and wholesale Christmas Tree Farm located in Plymouth, NH. It is owned and operated by the Ahern family who have been farming the property since 1897. Great Trees & Tons of Them. Our Fraser and Balsam Fir trees are as tall as 10' in the field for Choose and Cut. We will have pre-cut trees as tall as 11' to choose from...priced accordingly. We offer tree drilling for the "pin stands"! 253 Hill Road, Bath, NH 03740. Email: danablais@roadrunner.com or djblais@outdrs.net. Open: from the day after Thanksgiving and remain open until Christmas; from 10 am to 4 PM every day. We do not harvest a single tree before mid-November so we offer very full, fresh, fragrant trees and guarantee the quality of our products. With proper care, our trees easily last through the holiday season. We sell our trees and wreaths at the farm. Click here for our Facebook page. 392 Texas Hill Road, Plymouth, NH 03264. Phone: 603-536-1496. Email: dleblancski@gmail.com. Open: starting Friday after Thanksgiving, on Monday to Friday from 12 pm to 8 pm, Saturday and Snday from 8 am to 4 pm; LeBlanc's Hardware location open weekends only. Directions: for a map to our farm, click here. The LeBlanc's Tree Farm location has cut your own as well as precut trees. No cut your own at the hardware location. Route 112, 303 Wild Ammonoosuc Road, Woodsville 03785. Phone: 888-567-2981. Fax: 747-2981. Email: info@mtnstarfarms.com. Open: 10 am to 4 pm Saturday and Sunday from Thanksgiving weekend (including that Friday) through the third weekend of December. They have holesale, mail order, choose-and-cut and retail Christmas trees and wreaths since 1982. We specialize in cultivating high-quality Fraser fir and Balsam fir Christmas trees. Mountain Star Farms has been judged as the New Hampshire State Christmas Tree Champion eleven times at New England's largest fair - the Eastern States Exposition (Big E). In 2000, we were the Grand Champion of the Big E and were judged Grand Champion at the New Hampshire State Fair. Well behaved, leashed dogs are welcome. Fresh, precut trees available, too. Free hot ciderWe provide the saws, twine bale your tree for free for easy transport and setup, help you put the tree on your vehicle. We know the kids will love our "Blue Blizzard" barrel train. Fresh, precut trees available, too. Free hot cider. Route 10, 163 Dartmouth College Highway, Lyme, NH 03768. Phone: (603) 795-4392. Email: info@nicholstrees.com. Open: 9 am to 4:30 pm daily from the day after Thanksgiving until the day before Christmas. Directions: On Route 10, 8 miles north of Hanover Approximately 2 miles south of Lyme village. And for a map to our farm, click here. Payment: Cash, Check. 4 Christmas Lane, Bethlehem, NH 03574. Phone: (603) 444-6228. Email: info@therocks.org . Open: Saturday before Thanksgiving until December 24th, every day 10 am to 4 pm. Courteous service - from help cutting and transporting your tree to tying it on your vehicle. Free horse-drawn wagon rides, reserved for package customers until Sunday at 2 p.m. Free tree wrapping. Uniquely designed wreaths. The Rocks has been described as a modern day Norman Rockwell Christmas scene, complete with the jingling bells of our horse-drawn wagon rides and marshmallows roasted to golden at our fire pit. We have row upon neat row of perfectly shaped and scented fir trees grow in the fields at The Rocks, and visitors may wander the farm in search of their special tree. As your tree is baled for easy transportation and loaded on your vehicle, enjoy the holiday ambience that permeates the scene at The Rocks - from warm food and hot drinks to Christmas carols and a walk along our Scrapbook Trail. Courteous service - from help cutting and transporting your tree to tying it on your vehicle. Free horse-drawn wagon rides, reserved for package customers until Sunday at 2 p.m. Sunday Afternoons 2 to 4:00 pm is Locals Day. Discounts on Trees for Local Residents! 1 Ski Area Road, Waterville Valley, NH 03215. Phone: 603-236-8311. Directions: Click here for a map. There is also ice skating. 1775 Benton Road, North Haverhill, NH 03774. Phone: 603-787-6377. Email us at: info@windyridgeorchard.com. Directions: Interstate 93: Take exit 32, turn off ramp onto Route 112 West, follow 112 for 13 miles, turn left onto Route 116 South, follow for 7 miles, orchard is on left. Route 10: turn onto Benton Road/Route 116 at the North Haverhill Civil War monument, follow 116 for 3 miles, orchard is on the right And for a map to our farm, click here. Open: begins the Friday after Thanksgiving, 10:00 - 4:00 on weekends only, Call for a weekday appointment. Payment: Cash, Check. Join us for a festive family tradition. Enjoy a wagon ride to the Christmas Tree Plantation, choose and cut your special tree, browse the gift shop, and warm up with complimentary drinks and doughnuts. The gift shop features handmade wreaths, seasonal Yankee Candles, jams, jellies, crafts and New Hampshire gifts. We'll have plenty of pre-cut trees to choose from too!